The last few winters, I’ve been entrenched in a never-ending quest for the perfect winter jacket. Let me explain. I own a few winter riding jackets. All keep me warm or dry in a number of conditions. Yet, I still feel, each time out on a winter ride, I’m missing something. It could be 30 degrees and raining or 20 and snowing. I have jackets that are warm but not waterproof, winter shells that are windproof, but not very insulated and extremely warm jackets that just do not provide enough ventilation. As I’ve said in the past, I don’t work for any of the companies I review. I do not get paid to review a product. I purchase each product for my personal use, wear it or ride it, enjoy it or not. This year, I took a chance on Bontrager’s Old Man Winter Jacket. As you know, I tend to overdress when the temps get low. This leads to shedding layers midway down the trail. Fortunately the OMW provides plenty of ventilation, via two large zippered chest vents that are hydration pack compatible. I need to have a jacket that will keep me warm in a multitude of conditions. But the ability to fully ventilate, makes this jacket killer! When your out on a ride and the skies open up, rain, snow and sleet tend to fall. Having a hood helps, but having a hood with a Boa Dial that cinches down around your helmet, makes a cold, wet ride seem like a cold, wet ride where you stay warm and dry. Bontrager’s Profila softshell fabric, powered by 37.5 active particle technology provides what I believe is the warmest softshell on the market. There are warmer jackets, but at this weight, you’d be hard pressed to find something warmer. Storage is provided by two spacious zippered hand pockets and two zippered chest pockets. There are also two internal drop pockets. The semi fitted cut, with double cord adjustment at the waist, keeps water and other liquids from hitting your body. 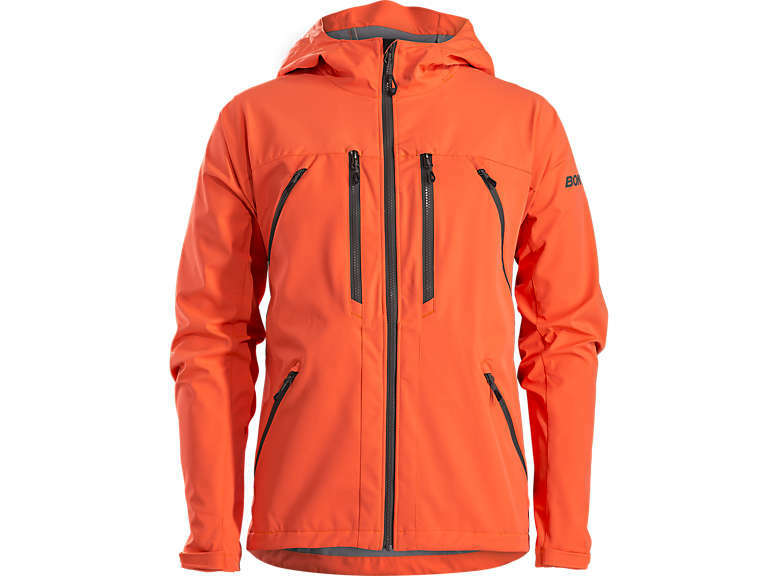 The radioactive orange color makes this jacket a bright choice for riding through hunting season or any season. Bottom Line: Finally, I have a jacket that checks all the boxes. If you want a winter jacket, that’s light, warm, waterproof and well ventilated with a Boa Dial hood, this is definitely the jacket for you! Bontrager calls it a MTB jacket. I call it an anything jacket. Get it, you won’t be sorry! On Sunday, a group of about 20 riders, met at Action Bikes and Outdoor to embark on the first of many casual rides through this beautiful town. At 10am, it was brisk, but sunny. Perfect weather for a town ride. I wanted to plan a route that followed through the many alley ways, from which Milford, looks a bit like a small European village. It really brings you back a few years. The crunch of leaves as we rolled through the lower part of town coupled by the incredible fall colors, added to the charm, as we stopped to gaze at the Delaware River from the overlook at the end of High Street. Crossing Harford Street, we slipped back to Water Street and after briefly checking out the water fall, we pedaled past the Waterwheel, across Milford Road and onto James Street. From there we turned into Pine Alley and again on Owega Road. Entering Grey Towers. The group gracefully climbed the hill through the beautifully landscaped property to the former home of Gifford Pinchot, the first Chief of the U.S. Forest Service. At the top, we stopped for a photo op. Cindy told the story of the Pinchot family and the significance of the home and property. We then cruised up through the parking area and started the long descent out of Grey Towers, onto Owega Road and back into town. This time, we rode in the upper alley ways heading east and eventually snaking down Cherry Alley alongside the Columns Museum to Broad Street, in front of the bike shop. Inside TC and Jeremiah had hot apple cider waiting for us. This is definitely the type of riding I enjoy the most. A group of people casually pedaling, chatting and enjoying the scenery. Can’t wait for the next one! I’m taking suggestions for December’s cruise. Here’s a few more pics. On Sunday, we are hosting a casual, fun, slow, group ride from Action Bikes and Outdoor. Pace will be slow, to take in all that Milford has to offer. We will cruise down the alley ways and see some cool stuff. Any bike will be perfect for this ride. No need to don the spandex. Street clothes will be the order of the day. Hope to see you there! On November 11th at 10 a.m. we are hosting a casual bicycle ride around Milford PA. Our host, “Rob” will be taking all participants through the alleys of Milford, pointing out all points of interest and historic landmarks. Any bike is welcome and casual warm athletic clothing is recommended. You will view beautiful gardens, fall foliage, a waterfall, and Grey Towers during this relaxed bike ride. The total distance will be 9 miles and it will take approximately 2 hours with several stops. When you are finished, enjoy a warm complimentary cider back at Action Bikes and Outdoor. This is a free event! The following is a guest spot from Brian with some gorgeous pics to help get us through the winter! Sometimes an offer is just too good to pass up. So, when a local like-minded cycling/hiking/skiing/beer tasting friend tells me about this great blog he reads and there’s this contest to submit a bicycling photo and win a pair of Tifosi cycling glasses, I started looking through my photos. Having nothing to lose, and a cool new pair of glasses to possibly gain, I started following the blog and entered Robert’s contest. I won, and so thanks are in order to all of you who voted for my image of my bike leaning on a Bucks County covered bridge on a snowy day. And, bigger thanks are in order to Robert for hosting the blog, and the contest. Summer, 2017…. A childhood friend of mine that I grew up with in southeastern PA is closing in on his 50th birthday at the end of January, 2018. Jon moved to San Diego nearly 20 years ago because he “hates the cold”. For fun, we’d been messaging back and forth about a bicycle vacation to Portland, OR, or some such location, but nothing ever gelled. Then, out of the blue, he sends me an email and invites me to go on a cycling vacation with him to a warm destination and celebrate his milestone birthday with him. Having visited him several times in San Diego in years past, it wasn’t hard for him to set the hook. It is beautiful there, which is why so many cyclists choose to train there year round. We quickly narrowed down our choices to somewhere in Arizona, or maybe try out an all-inclusive 4 day tour with Trek Travel in Solvang, CA. Since it was his birthday, I let him choose and so we booked our 4 day Ride Camp with Trek Travel to Solvang for the end of January into the beginning of February, 2018. We figured it would be nicer to just let someone else handle all the details and that way we’d end up spending less time fretting over minutia and more time having fun on 2 wheels. Jon knows I ride all year in PA, as does he in San Diego and so we knew we’d be fit enough to put in some big mile days together this early in the year. Some background on Solvang…it is a small city in the Santa Ynez Valley of California, known for its Danish style architecture. The area outside of town is full of hills, vineyards, horse and cattle farms and agriculture. It definitely has a tourism driven economy, and so it caters to showing out-of-towners a good time. We stayed at the Hotel Corque, which was very comfortable for our time there. There are tons of shops and restaurants, a totally awesome motorcycle museum, places to do wine tastings, and Firestone Walker Brewing is only 3 miles down the road in Buellton. Yes, we went there. Mmmmm, beer. Since Trek Travel pretty much handles everything except your transportation to and from Solvang, we just had to drive up from San Diego after I arrived from frigid PA. The package included lodging, nearly all food, bikes and helmets and a Garmin with all routes pre-loaded, two guide hosts to show you around and ride with you, and a Trek Travel support van to refuel from or drop clothes in as the day warmed up. The riding was very enjoyable with high temp’s around 80* every day, along with mostly sunny skies. It was a wonderful mid-winter reprieve for me to go someplace warm, be with my friend, meet some new folks and put in some miles. We rode 4 consecutive days totaling about 165 miles and then said goodbye to our hosts and Solvang. I booked a few extra days to spend back in San Diego with Jon and his family, and so a day later we put in a beautiful road ride through Rancho Santa Fe which included some coast time. My friend Dawn, also formerly from PA drove from Upland, CA to come see me and joined us on the last ride. A good week indeed, as Jon and I ended at just over 200 miles each. I landed back in Philadelphia on the eve of the Super Bowl, and as I drove home to Upper Bucks County all I could think about was how much I wasn’t enjoying driving in the ice storm that fell that evening. It was sunny and warm just a few hours earlier that same day…on the other coast. The time has come; no more photos. After sifting through the thousands of submissions (that might be a bit of an exaggeration), we’ve narrowed it down to three finalists. While all the pics are beautiful, only 3 can be finalists. Now, it’s your job to pick the winner. Please, help me select the winning photo by posting to comments and picking photo 1, 2 or 3. Thank you for your votes! A winner will be picked on Friday, November 24th. It’s that time of year again. Riding Milford’s 2nd annual photo contest. To celebrate the two-year anniversary of the blog and to recognize how beautifully cycling and photography go hand in hand. You see, there are cyclists who ride to simply go fast, and while there is certainly a place for that, a lot of us are now simply riding for escape and adventure. We slow down to take in the sights, explore new paths and record our rides a different but not unique way, in photographs. We post them on social media for all the world to see. And for that we are lucky. Lucky to get a look at what someone else experienced. Lucky to reach out and let that person know how beautiful their ride was. To enter the contest, comment to this post, with a photo of your bicycle in nature by 8:00pm on Sunday, December 19th. The winner will receive a pair of Tifosi Crit, Fototec sunglasses in Crystal Black (an $80 value). If we receive 25 photos, there will be 2 winners! If we receive 50 photos, there will be 3 winners!